So, half of the holiday season has come and gone (I hope it all went well for everyone!) and, with the constant barrage of digital ways to stay in touch with everyone, it reminded me of an iOS feature that’s become my favorite in iOS6. Full disclosure: I absolutely adore the people in my life. I really do. But, there are some times when we all need a break from those little popups that beep and blip, begging for our attention. And sometimes it’s not even people! I also have a few weather apps that send along severe weather notifications that, while interesting, aren’t exactly worth being woken up at 3AM for. So with all of these helpful notifications, how do we block them out when we don’t want them interupting our lives? Well, luckily with the advent of iOS6, we have the ability baked right into our devices. Cool! So where do I find it? 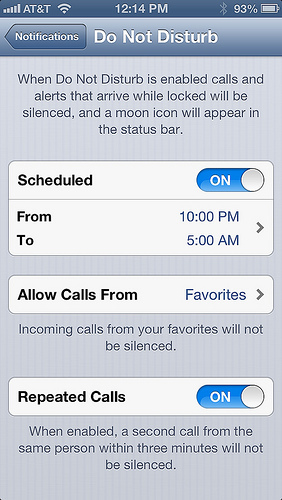 Head into “Settings” and, fourth from the top, you will see “Do Not Disturb”. To turn it on, just toggle the switch from “Off” to “On”. A little crescent moon icon will show up to the left of the clock up at the top of your iOS device screen, signifying that it’s activated! When “Do Not Disturb” is switched on, absolutly no notifications will come through. This includes emails, texts, Twitter updates, Game Center updates, anything in notification center, even phone calls. This sounds great and all, but what if someone needs to get in touch in an emergency and I forgot to turn it off? Really great question! If you go into “Settings” and then “Notifications”, you’ll find another ”Do Not Disturb” section (which is really un-Apple-like, but I digress). In here, dwells the secret sauce that makes “Do Not Disturb” (I am just going to refer to it as “DND” for the rest of this post) so great. 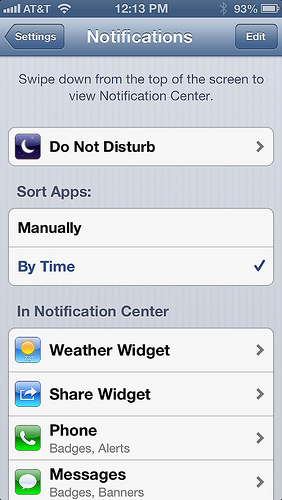 In this settings menu, you can schedule when you want DND automatically turned on and off! For me, this is great because I hate getting disturbed by my phone while I sleep, so I set it for 10PM and 5AM every day. Once scheduled, the DND mode is enabled everyday during that span of time until you opt to turn it off. The emergency phone call dilemma is handled with the “Allow Calls From” option. I personally set it for “Favorites” so the folks I have listed as favorites in my “Phone” app come straight through whenever they call. You can also set this to “Everyone”, “No One” (if you really mean business), or you can even set it for a specific group you have setup in your Contacts app. Again, this only pertains to phone calls, all other notifcations from apps still will not come in when DND is scheduled/enabled. The last setting is for “Repeated Calls”. When this is turned on, a person will have the ability get through your DND setup if they call twice in the span of 3 minutes. Personally, I LOVE this setting, as I often tell people if there is ever a true emergency, please call us twice repeatedly if we don’t answer the first time. It’s a small thing, but the fact that Apple threw this option in, is just genius in my humble opinion! This way, if for whatever reason, someone important to you is calling from a phone that isn’t theirs, they’ll get through. So that’s it! Go enjoy some quiet time! We all love being connected (maybe we love it too much), but sometimes the act of unplugging can be a nuisance. With the new DND option, it’s a lot easier. So, turn on DND and take that mid-day nap you’ve been promising yourself! You totally deserve it! They also, unfortunately, had reports of this (which I actually fell victim to) so watch out for it. I fixed mine by turning DND on an off.